Sometimes the unexpected parts of an itinerary make the journey even more meaningful. Knowing that I would be in Europe in mid-June, I was delighted to dovetail my itinerary with opportunities to present SCI’s work. First was Clean Tech Week in Annecy, France followed by the Tech4Dev conference, the biennial flagship event of the UNESCO Chair in Technologies for Development held in Lausanne, Switzerland. My presentation at Clean Tech Week was extremely well-received, which was encouraging, as it was the second time I had given a presentation for SCI in French – the first time was only two weeks earlier in Haiti. I was taken by surprise when the audience spontaneously applauded twice during my introduction: once when I joked that, when my parents had placed me in a French elementary school for two years, they had predicted that I would give a presentation in French that day, and second when I mentioned having earned a Ph.D. in physics. I had a friendly and intelligent audience with excellent interactions afterward, including connecting further with SCI partner and promoter of solar cookers Philippe Préau of Soleil Vert. On my way to Lausanne, I passed through Geneva, where I was able to meet with three SCI connections. 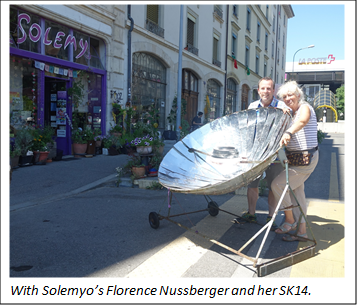 I enjoyed meeting with Solemyo’s Florence Nussberger, who runs a storefront just steps from the Geneva train station and solar cooks just outside her store, regularly, when there is sun. 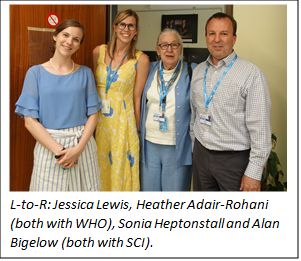 Next, it was a pleasure to meet Representative of SCI to the United Nations in Geneva Sonia Heptonstall, Ph.D., who joined me for a meeting with Jessica Lewis and Heather Adair-Rohani of the World Health Association (WHO) to focus on establishing a formal partnership between SCI and WHO. My next stop was Lausanne, Switzerland for the Tech4Dev conference, held at École Polytechnique Fédérale de Lausanne (EPFL), where it was an honor to have my presentation – about testing solar cookers according to ISO standards and the SCI Performance Evaluation Process (PEP) – selected as a full paper presentation. Stay tuned for an update on this publication. While in Lausanne, I was invited to meet with the research group "Nanotechnology for Solar Energy Conversion" led by Dr. Andreas Schüler. 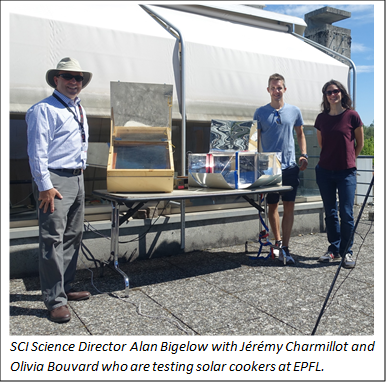 I was fascinated to meet his group members Olivia Bouvard and Jérémy Charmillot and to see how they were actively testing solar cooker parameters and to have a thorough tour of their research facility. We enthusiastically agreed to form a partnership between SCI and EPFL. 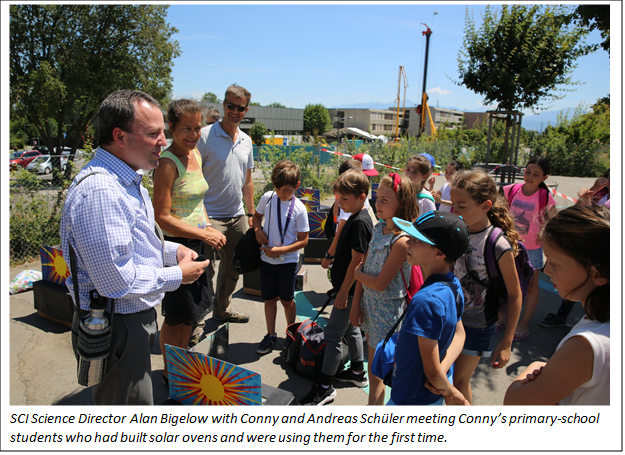 Taking that unexpected meeting a step further, Andreas asked if I would like to next go to his wife Conny’s school where her students have been studying renewable energy and were trying out their home-made solar ovens for the first time. Of course, I had to accept this invitation and was subsequently charmed by meeting primary-school students with such passion for sustainability and for solar cooking. And in each of their solar ovens, there was a chocolate cake baking by the sun.